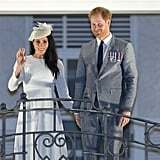 Prince Harry and Meghan Markle have officially completed their first royal tour as husband and wife! 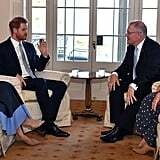 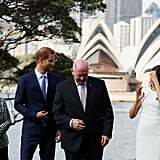 After touching down in Australia on Oct. 14, Meghan debuted her growing belly in style as she and Harry met with Governor General Sir Peter Cosgrove and his wife, Lady Cosgrove, at Admiralty House in Sydney. 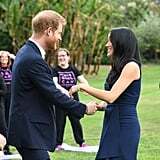 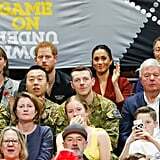 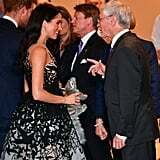 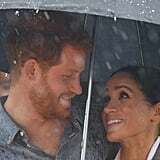 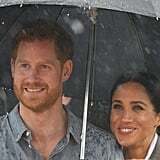 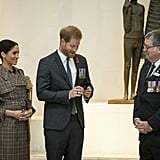 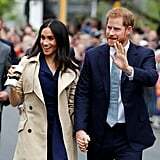 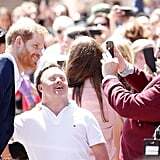 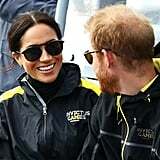 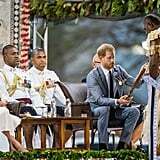 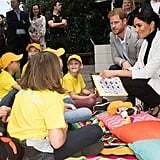 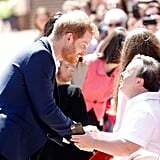 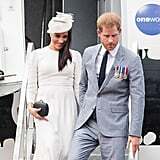 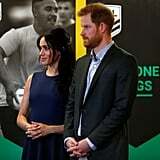 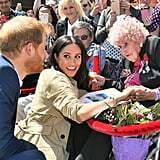 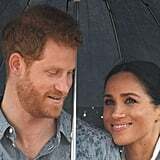 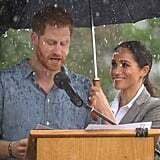 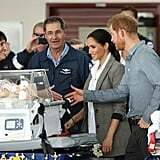 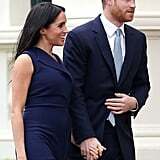 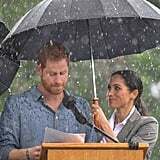 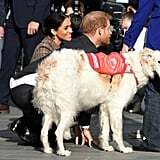 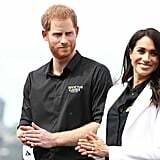 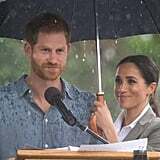 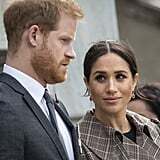 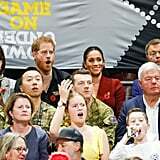 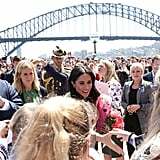 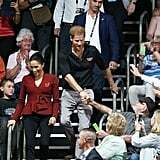 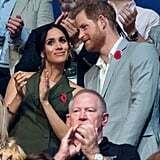 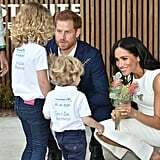 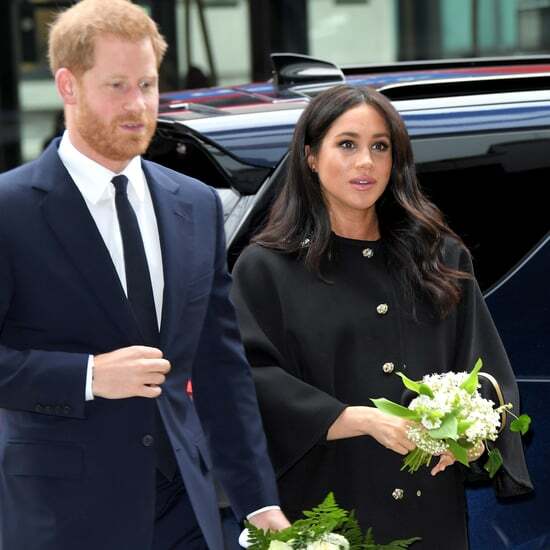 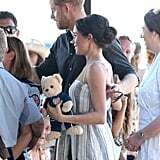 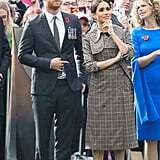 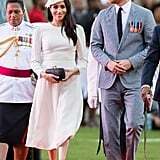 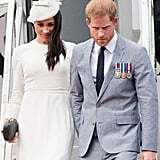 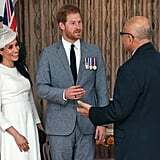 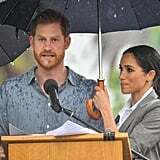 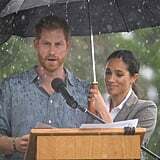 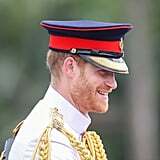 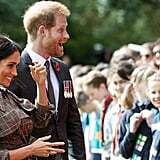 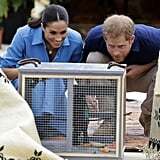 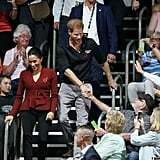 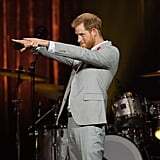 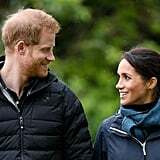 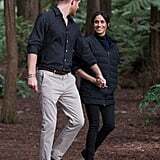 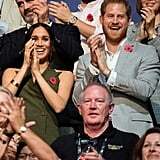 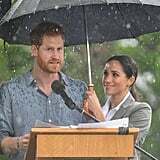 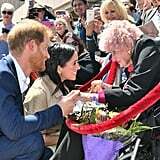 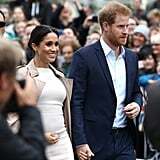 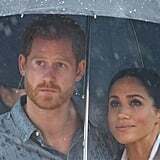 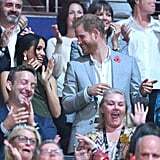 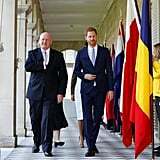 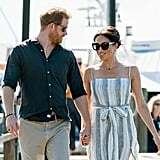 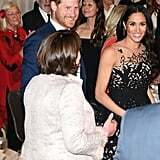 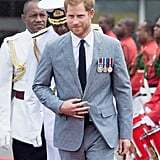 The couple were joined by representatives from Harry's Invictus Games, and Meghan was positively glowing in a white dress, while Harry looked dapper in a navy suit. 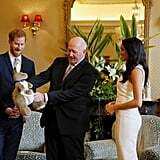 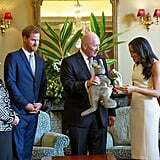 To make things even sweeter, the governor general gifted Meghan with her first baby present: a kangaroo stuffed toy! 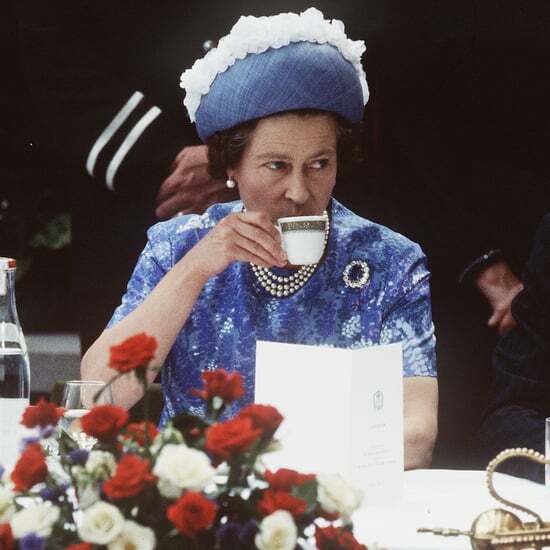 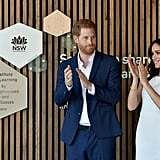 Meghan and Harry had a busy couple of weeks. 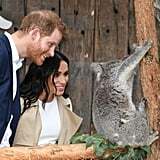 Not only did they get to hang out with some baby koalas at the zoo, but they also caught a ferry to the Opera House, where they watched a rehearsal by the Bangarra Dance Company. 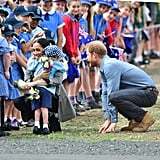 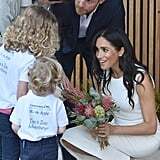 During their stop in Dubbo on Oct. 17, Harry and Meghan were greeted by a group of schoolchildren and Harry delivered a powerful speech about mental health. 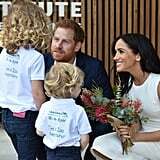 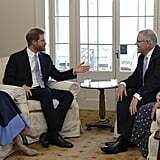 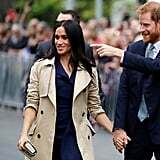 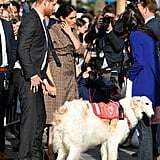 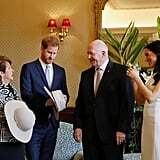 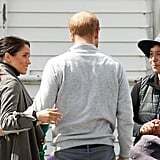 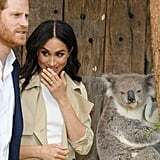 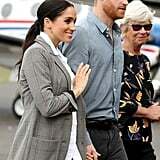 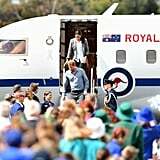 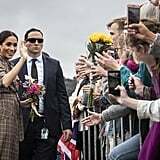 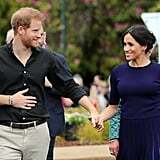 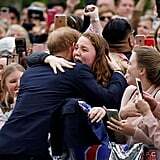 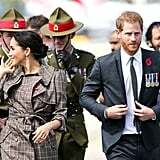 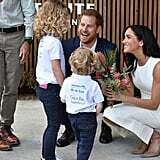 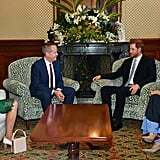 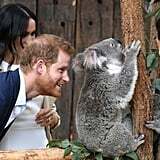 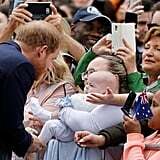 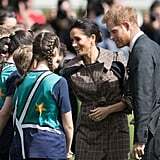 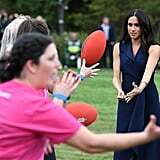 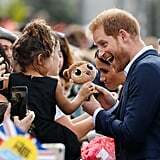 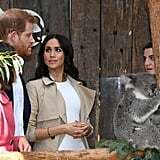 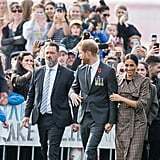 The royal couple landed in Melbourne on Oct. 18, where they met with some very emotional fans before attending a reception hosted by the governor of Victoria at the Government House. 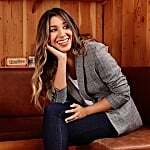 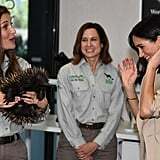 There, Meghan received a little scare while watching a science experiment, but don't worry — it ended in a lot of giggles. 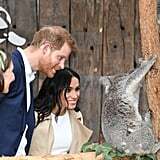 Later, they visited Charcoal Lane and got a taste of Australian cuisine before heading to the beach. 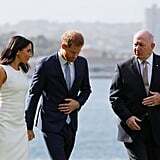 On Oct. 19, Harry and Meghan visited Sydney, where they met with OneWave founders Grant Trebilco and Sam Schumacher at Bondi Beach. 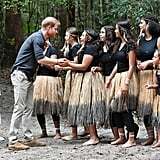 OneWave is a local surfing community group that raises awareness for mental health. 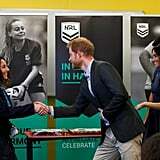 The couple also paid a surprise visit to the Macarthur Girls High School in Parramatta. 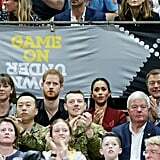 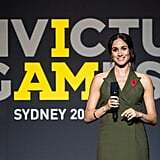 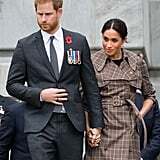 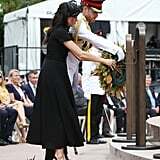 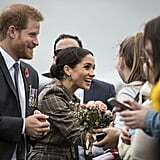 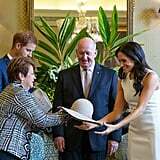 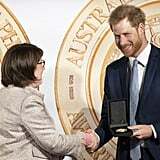 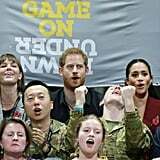 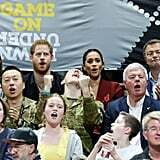 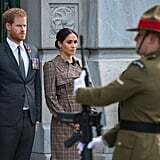 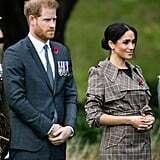 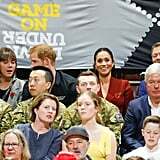 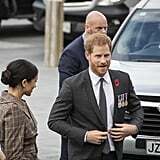 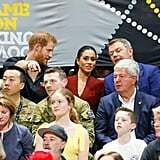 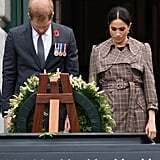 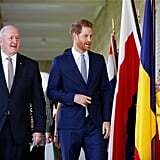 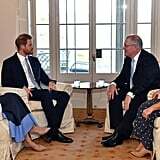 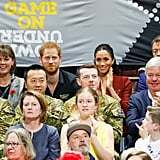 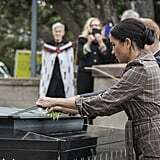 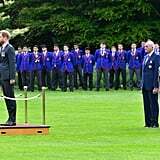 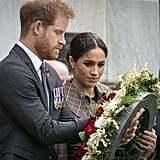 Come Oct. 20, Meghan and Harry attended the official opening of ANZAC Memorial, followed by an important return for the royals as they participated in the 2018 Invictus Games Opening Ceremony. 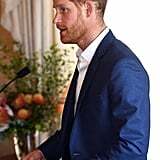 They started things off at the Jaguar Land Rover Driving Challenge, and Harry made sure to rehearse his speech in front of Meghan before the evening celebration at the Sydney Opera House. 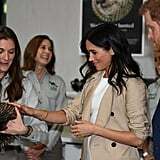 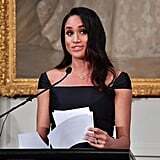 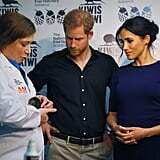 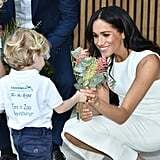 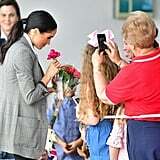 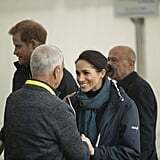 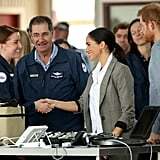 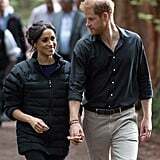 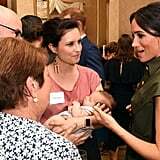 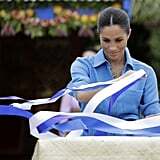 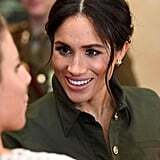 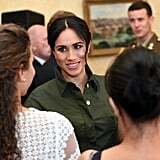 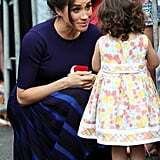 On Sunday, Kensington Palace revealed that Meghan would be cutting back on her events throughout the tour to rest. 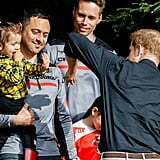 Harry stepped out for an Invictus Games cycling event before being joined by Meghan in the afternoon for sailing. 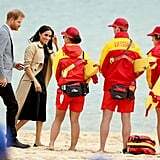 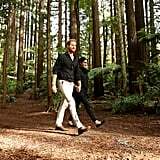 On Monday, the pair headed to Fraser Island, where they took a sunny stroll together and met with fans. 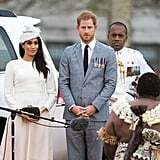 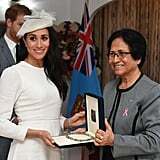 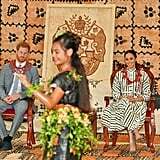 The following day, Harry and Meghan left Australia for Fiji, where they were greeted in a strictly traditional fashion and attended a reception and dinner hosted by the nation's president. 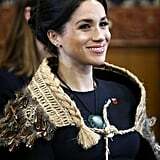 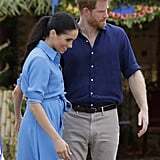 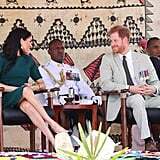 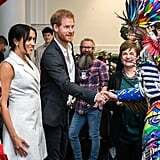 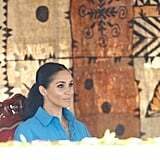 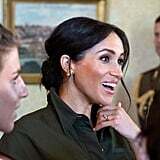 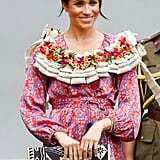 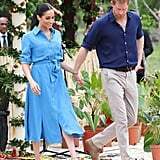 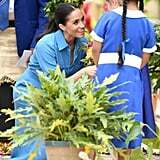 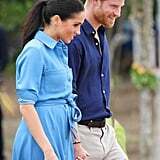 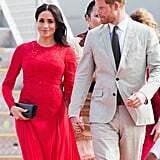 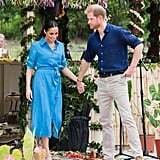 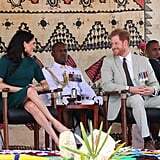 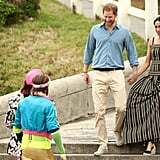 On Wednesday, the duo donned traditional outfits when they met with students at the University of the South Pacific and Meghan gave her first speech during the tour. 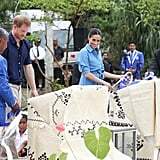 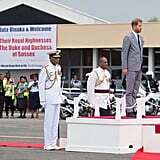 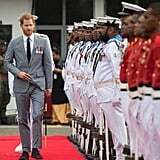 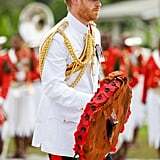 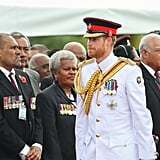 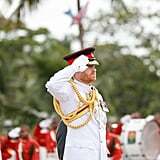 The royals ended their time in Fiji by attending the unveiling of the Labalaba statue in Suva on Thursday. 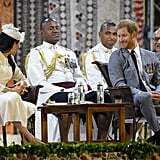 Soon after, the couple traveled to dine with the king of Tonga. 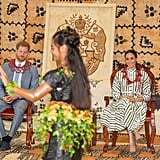 On Friday, the couple kicked off their day by heading to the St. George Government Building to meet with the prime minister of Tonga, 'Akilisi Pohiva, and several other cabinet ministers. 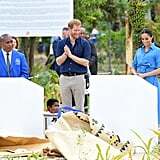 They capped off their visit by attending the unveiling of The Queen's Commonwealth Canopy at Tupou College before hopping on a plane and returning to Australia for the Invictus Games. 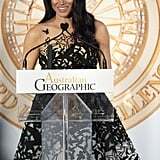 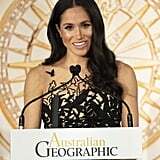 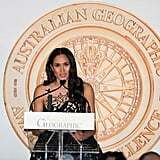 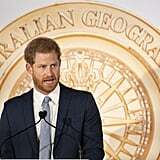 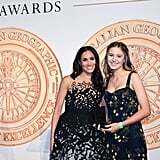 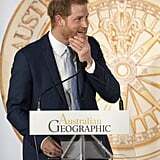 After arriving in Sydney, Harry and Meghan got all glammed up and stepped out together for the Geographic Society Awards. 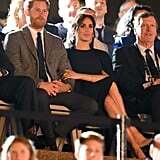 Meghan looked stunning in a black and white gown, while Harry cut a suave figure in a navy suit. 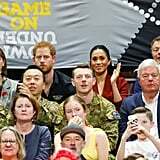 The pair enjoyed the final day of the Invictus Games by attending the wheelchair basketball final at the Quaycentre and delivered their own inspiring speeches at the closing. 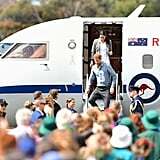 They departed Sydney Sunday morning, and headed for New Zealand. 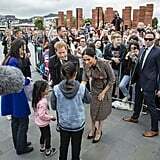 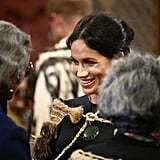 On Oct. 28, Harry and Meghan received the hongi, a traditional Maori greeting, upon arriving in Wellington. 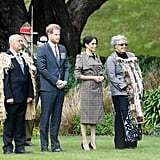 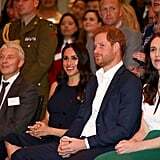 Meghan and Harry joined Prime Minister of New Zealand Jacinda Ardern for a reception hosted by Governor-General of New Zealand Patsy Reddy to celebrate the 125th anniversary of women's suffrage. 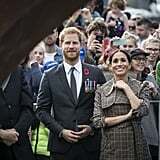 The following day, the royal couple met with the local youth at the Maranui Cafe to discuss their various mental health projects. 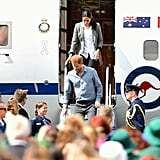 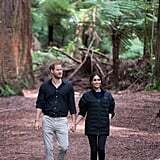 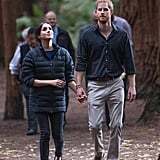 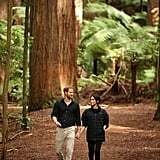 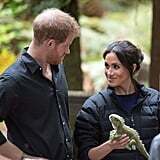 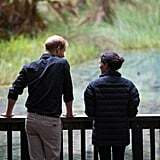 Meghan and Harry then departed by helicopter for Abel Tasman National Park. 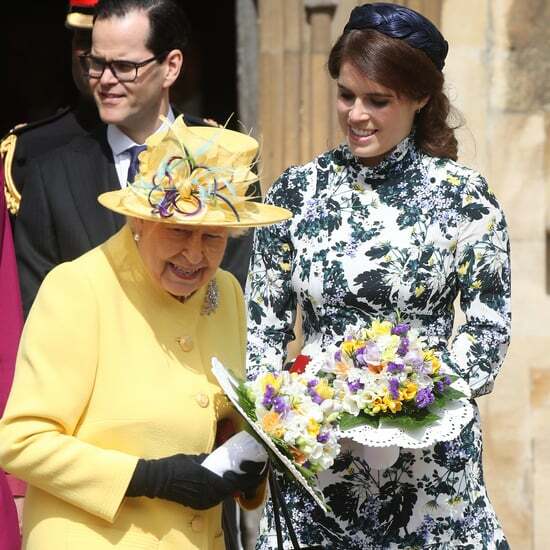 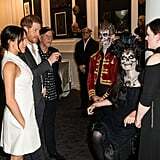 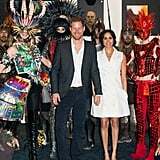 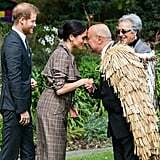 On Oct. 29, the couple visited Courtnay Creative, where guests were dressed in an array of costumes, before they attended the unveiling of The Queen's Commonwealth Canopy in Redvale the following day. 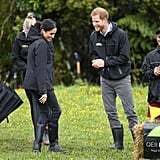 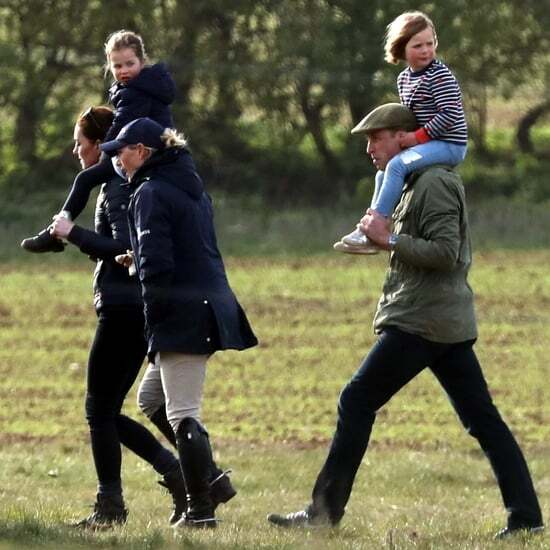 Meghan and Harry kept things casual in jeans and matching rain boots, while they played "welly wanging" along with a group of local children. 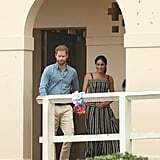 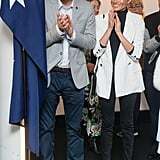 Later, the couple made an outfit change and visited the Pillars charity, which supports children who have an incarcerated parent, and attended a reception for young leaders hosted by the prime minister. 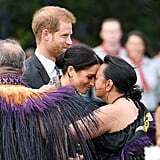 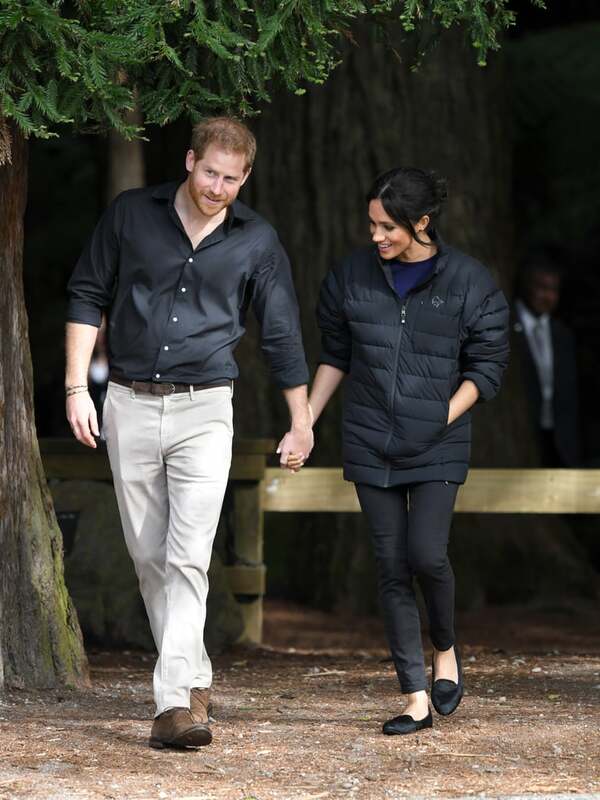 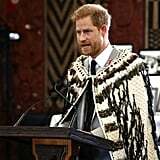 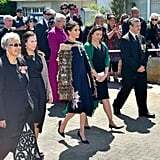 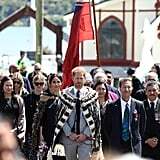 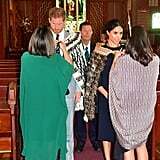 Oct. 31 marked the end of Harry and Meghan's tour, and the couple kicked off their last day by stepping out in traditional cloaks at a powhiri (a Māori welcoming ceremony) and luncheon at Te Papaiouru Marae in Rotorua. 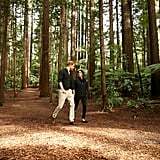 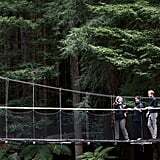 They later named kiwi chicks at the National Kiwi Hatchery and visited Redwoods Tree Walk. 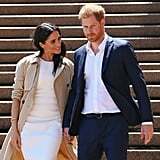 Harry and Meghan's tour comes on the heels of Kensington Palace's announcement that the pair are expecting their first child! 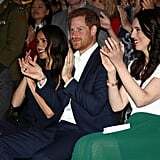 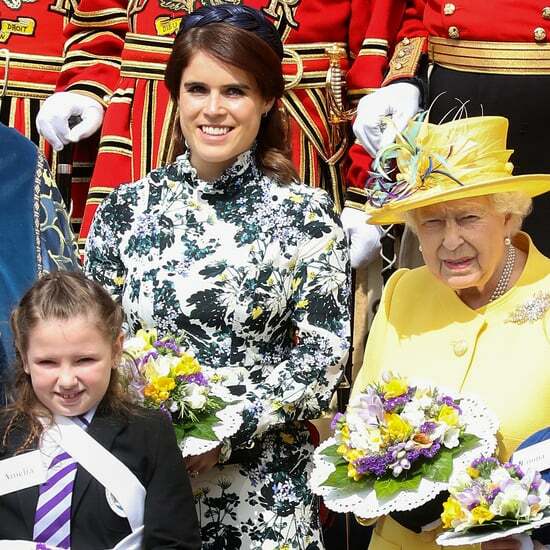 Even though we just found out about the news, Harry and Meghan reportedly told the royal family at Princess Eugenie's wedding. 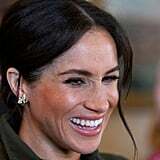 Congrats to Meghan and Harry!